I repeat this post from 4 years ago in honor of Stuart Scott who sadly passed on Sunday morning Jan. 4, 2014 after a long battle with cancer. While cancer may have ended Stuart Scott's life too soon, his courage, faith, and strength makes him the winner. Cancer could never take those courageous qualities from him and in my eyes that means he defeated the cancer. May Stuart Scott rest in peace and may God ease the pain for his family and friends. 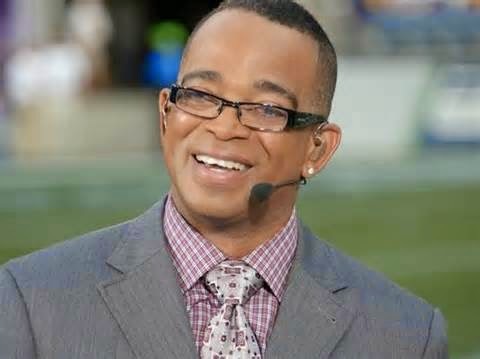 Stuart Scott, long time sports anchor on ESPN's Sports Center, was discovered to have a malignancy after a surgery in November of 2007. He had another surgery to remove cancerous tissue and had chemotherapy, but he still returned to the airwaves, just a month later. Stuart Scott continued his fight as it was revealed in 2011 that he was again battling cancer. "The cancer entered remission in early 2012, but was again diagnosed with cancer on Jan 14, 2013". This man, showing no self pity, has been valiantly fighting cancer ever since. "Scott was honored at the ESPYS last night [Wednesday] July 16, 2014 with the Jimmy V award for his ongoing, inspirational fight against cancer." In accepting the award, this brave man said that he had four surgeries in seven days in the week prior to his appearance at the ESPY's because of liver complications and kidney failures. Talk about courage, oh my God. May the Lord bless this man and be right along side of him in his continuing battle against cancer. Here is the moving, emotional video of Stuart Scott in his acceptance speech at the ESPY awards on Wednesday night. If this doesn't bring many tears to your eyes, you are not human. Stuart Scott is a profile in courage. Stuart Scott is a tremendous role model who is an inspiration to millions of people. God Bless Stuart Scott. On a personal note, I would like to say, both of my parents Reenie and Pop, died from complications of cancer in their mid-80's. My parents were also, tremendous profiles in courage. Both Reenie and Pop battled valiantly, never giving up, and never once showing any ounce of self pity, but instead acknowledging the great blessings of their life. Cancer is evil, and I can say my parents defeated it as they never gave into it. My parents are my heroes. While they might not be in this world, they are always still with Sandy, Susan, Brad and me. Too bad cancer-you lost! As Stuart Scott so eloquently said, "when you die, that does not mean you lost to cancer. You beat it by how you live, why you live and the manner in which you live." I want to say that not just Stuart Scott, and my parents, but all those now who are fighting valiantly and living their lives beating cancer as they are not giving in and they continue to fight, are all my heroes. Each and everyone of you are all profiles in courage. This blog honors you all! Stuart's espy speech was one I will always remember . Those specIal thoughts about our Reenie and pop ring so true--- their legacy was not altered one bit by their cancer which may have taken them physically but could not touch them spiritually ! Thanks Brad for those wonderful words.